A roll of the drums, please. LeBron James is ready for his close-up. SAN ANTONIO – LeBron James is ready for his close-up. The superstar drawing comparisons with Michael Jordan leads his Cleveland Cavaliers into their first NBA finals against Tim Duncan and the San Antonio Spurs, who are going for their third title in five years. By Tom Withers. Game starts 9 p.m. AP Photos. My reaction when I read both these items was the same. This line is said by a woman who thinks she is about to shoot a closeup in her great comeback film with DeMille. But she is not because she has gone insane after committing a murder. 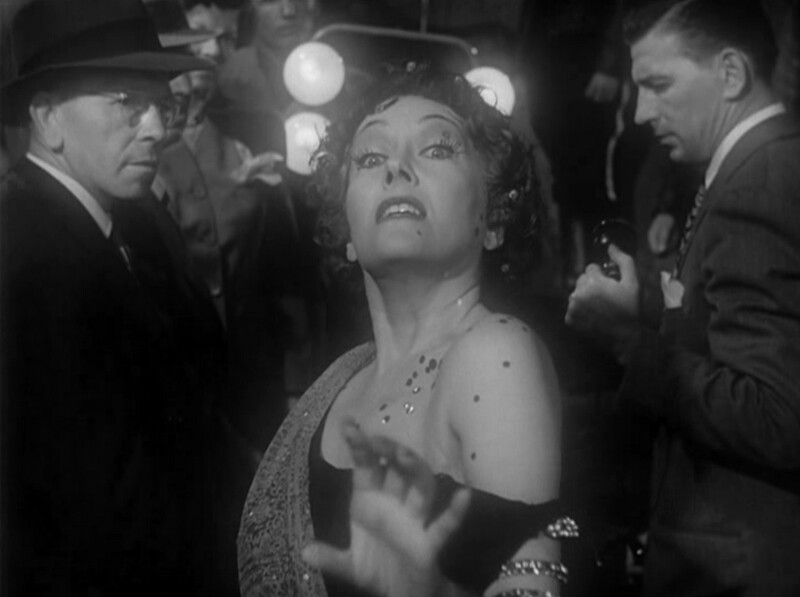 The line both ends and sums up the greatest tragic delusionary in cinema, a once-grand heroine who is no more. But because life can be strangely merciful, the dream she had clung to so desperately had enfolded her. But it is NOT a complimentary line. And it’s still less so to apply it to someone like LeBron James — young and with his best years ahead of him. Is it ignorance or is there really no text in this house? … cuz then it would be a lock-down cinch. The NBA Finals start tonight, and its due compensation to me for my not getting an Ann Coulter book release on my birthday THIS year. 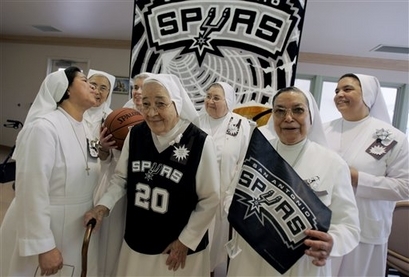 And the Spurs have got a whole team of nuns praying for them and cheering them. “We pray for them to win, but we also pray for them to continue their sportsmanship,” said Sister Sandra Neaves, head of the [Salesian Sisters] in the Western U.S.
“We make a lot of noise in that room,” laughed Sister Angelina Gomez. On Thursday, four of the nuns will attend the opening game of the championship series against the Cleveland Cavaliers. The tickets were a gift from the NBA. The nun in the middle of the picture is a Hispanic lady, and I don’t think it’s a coincidence that she’s wearing a Manu Ginobili shirt. I think the Spurs are the only team in the NBA with two foreign players from the same country. With two players from the gold-medal country (none on the Cavs), how can you lose? And the Spurs will have the intercessionary prayer of the dead too. Sister Filomena Conte, 86, was the most avid fan among them. She watched or listened to every game, praying for the team and corresponding with Coach Gregg Popovich. Conte died March 8, but the sisters have taken up her cause in cheering and praying for the Spurs. If the Spurs win the championship, “I won’t be surprised if she had something to do with it,” Neaves said. What do you mean “if”? I would be stunned if the Spurs lose more than one game. The Cavs Web site is playing regular-season highlights from November, as if that counts at all — remember when Dallas was gonna win 70 games and sweep through the playoffs? They were awesome. The Spurs have got more than one reliable offensive option, a top-flight point guard to the Cavs none, and an unguardable center (unless Anderson Varejao’s hair gets in the way). Bruce Bowen’s obviously not gonna shut down LeBron totally, but the Spurs play good enough overall team defense that he’ll work for everything and the Cavs second and third options are not gonna be there (Larry Hughes and Daniel Gibson are streaky enough as it is, and Zydrunas Ilgauskas can’t create for himself). You obviously can’t bet against LeBron doing what he did in Game 5 against the Pistons, maybe the greatest single-player performance I’ve ever seen, made greater by the total lack of output from the rest of the team. But you can bet against it happening more than once. I don’t know that I know any Cavaliers fans to win any bets off of, even among the Ohio residents I know (Stults? Father Fox? Rich?). But comments are welcomed from fans of loser teams like the Pistons, the Lakers (even erstwhile ones; no explaining some people), the Mavericks. Even from SoCal sports fans who dislike the Lakers (CQ on that one, Joe?) but who can at least celebrate a title in the other spring playoff sport. As long as these fans acknowledge that Tony Parker is only half-French.